Razer, an American company which specializes in computer hardware marketed specifically to gamers, will now venture to a more lucrative business, making a smartphone. Well, not just that, but a gaming smartphone. 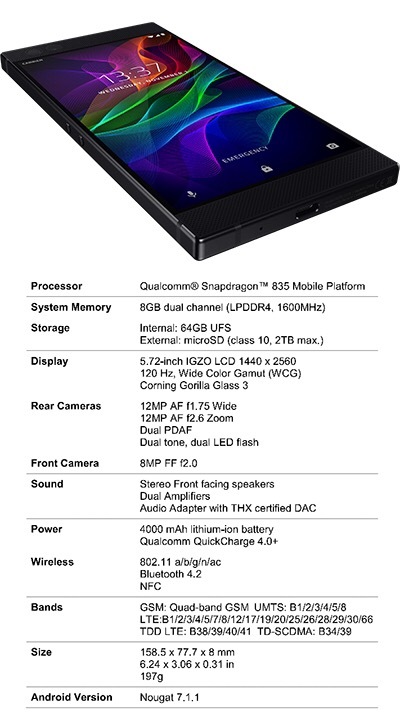 Launching on November 17 at an estimate SRP of P $700, Razer’s Mobile Phone will feature a Qualcomm Snapdragon Processor, 8GB dual channel DDR4 RAm at 1600Mhz and on top of that, it will also feature a first of its kind in a mobile phone to have 120hz ‘Ultramotion’ display. Imagine playing Clash of Clans or your all time favorite Candy Crush on a smooth as butter display. Aside from that, Razer integrated an THX-certified sound system so you will enjoy more of your streaming whether be it on Spotify or Netflix. But focus of Razer’s developing a mobile phone isn’t about that,it’s all about gaming. With the recently released Arena of Valor and other MOBA games – pretty sure they will take advantage of the beefy hardware of the Smartphone that Razer will release. Network provider upon launch will be T-Mobile and AT&T in North America and exclusive to Three in Europe. Razer is now accepting preorder at Razerzone.com and Three in Europe. Soon, it will also be available on Amazon and select Microsoft stores across the US.